Carnegie Hall is a concert venue in Midtown Manhattan, in New York City, located at 881 Seventh Avenue, occupying the east stretch of Seventh Avenue between West 56th Street and West 57th Street. Built by philanthropist Andrew Carnegie in 1890, it is one of the most famous venues in the United States, for both classical and popular music, renowned for its beauty, history, and acoustics. Carnegie Hall has its own artistic programming, development, and marketing departments and presents about 100 performances each season. It is also rented out to performing groups and for public speeches. It has no resident company, although the New York Philharmonic was officially resident there until 1962. During the twentieth century, Carnegie Hall was one of the world's premier performing arts venues, hosting the world's greatest musicians, singers, stage performers, and speakers. It remains an active force in the artistic culture of New York City today. Carnegie Hall contains three distinct, separate concert halls: The Main Hall (Isaac Stern Auditorium), the Recital Hall (Zankel Hall), and the Chamber Music Hall (Weill Recital Hall). Carnegie Hall's main auditorium seats 2,804 on five levels. The Main Hall is admired for its warm, live acoustics. 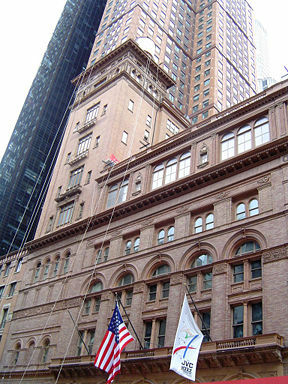 As a result, it is commonplace for critics to express regret that the New York Philharmonic plays at Avery Fisher Hall in Lincoln Center, and not in its former home in Carnegie Hall. It was named for the violinist Isaac Stern in 1997. "It has been said that the hall itself is an instrument," Stern once remarked. "It takes what you do and makes it larger than life." The Main Hall is enormously tall, and visitors to the top balcony must climb 105 steps. All but the top level can be reached by elevator. Since its construction, most of the era's greatest performers of classical music have played in the Main Hall, and its lobbies are adorned with signed portraits and memorabilia. Several popular music legends have given memorable performances at the hall including Judy Garland and Dame Shirley Bassey, both of whom recorded live albums at the hall. Zankel Hall, which seats 599, is named for benefactors Judy and Arthur Zankel. Originally called simply "Recital Hall," this was the first auditorium to open to the public in April, 1891. It was leased to the American Academy of Dramatic Arts in 1898, converted to a cinema around 1959, and was reclaimed to be used as an auditorium in 1997. The newly reconstructed hall opened in September 2003. Due to its location below street level, passing subways can be heard through the walls. Weill Recital Hall, which seats 268, is named for Sanford I. Weill, the chairman of Carnegie Hall's board, and his wife Joan. This auditorium, in use since the hall opened in 1891, was originally called "Chamber Music Hall" (later Carnegie Chamber Music Hall); the name was changed to Carnegie Recital Hall in the late 1940s, and finally became Weill Recital Hall in 1986. The building also contains the Carnegie Hall Archives, established in 1986, and the Rose Museum, which opened in 1991. Carnegie Hall was designed in a Revivalist brick-and-brownstone Italian Renaissance style by William Tuthill, an amateur cellist who was a member of the board of the Oratorio Society of New York, along with Carnegie. Richard Morris Hunt and Dankmar Adler aided as consultants. The success of the building is considered largely due to Tuthill's design. 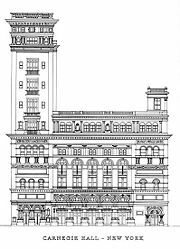 Carnegie Hall is one of the last large buildings in New York built entirely of masonry, without a steel frame. However, when several flights of studio spaces were added to the building near the turn of the twentieth century, a steel framework was erected around segments of the building. The exterior is rendered in narrow "Roman" bricks of a mellow ocher hue, with details in terracotta and brownstone. The foyer avoids Baroque theatrics with a high-minded exercise in the Florentine Renaissance manner of Filippo Brunelleschi's Pazzi Chapel: White plaster and gray stone form a harmonious system of round-headed arched openings and Corinthian pilasters that support an unbroken cornice, with round-headed lunettes above it, under a vaulted ceiling. The famous white and gold interior is similarly restrained. Booker T. Washington speaks at Carnegie Hall. Industrialist and philanthropist Andrew Carnegie paid for for the hall's construction. It was intended as a venue for the Oratorio Society of New York and the New York Symphony Society, on whose boards Carnegie served. Construction began in 1890, and was carried out by Isaac A. Hopper and Company. Although the building was in use from April 1891, the official opening night was on May 5, with a concert conducted by maestro Walter Damrosch and composer Peter Ilyich Tchaikovsky. Originally known simply as the "Music Hall" (the words "Music Hall founded by Andrew Carnegie" still appear on the façade above the marquee), the hall was renamed Carnegie Hall in 1893, after board members of the Music Hall Company of New York (the hall's original governing body) persuaded Carnegie to allow the use of his name. Several alterations were made to the building between 1893 and 1896, including the addition of two towers of artists' studios, and alterations to the auditorium on the building's lower level. The hall was owned by the Carnegie family until 1925, when Carnegie's widow sold it to a real estate developer, Robert E. Simon. When Simon died in 1935, his son, Robert E. Simon Jr. took over. By the mid-1950s, changes in the music business prompted Simon to offer Carnegie Hall for sale to the New York Philharmonic, which booked a majority of the hall's concert dates each year. The orchestra declined, since they planned to move to Lincoln Center, then in the early stages of planning. At the time, it was widely believed that New York City could not support two major concert venues. Facing the loss of the hall's primary tenant, Simon was forced to offer the building for sale. A deal with a commercial developer fell through, and by 1960, with the New York Philharmonic on the move to Lincoln Center, the building was slated for demolition to make way for a commercial skyscraper. Under pressure from a group led by violinist Isaac Stern, special legislation was passed that allowed the city of New York to buy the site from Simon for $5 million, and in May of 1960, the nonprofit Carnegie Hall Corporation was created to run the venue. It was designated a National Historic Landmark in 1962. The building was extensively renovated in 1983 and 2003, by James Polshek, who became better known through his Post-Modern planetarium at the American Museum of Natural History. Polshek and his firm were involved since 1978, in four phases of the Hall's renovation and expansion, including the creation of a Master Plan in 1980; the actual renovation of the main hall, the Stern Auditorium; and the creation of the Weill Recital Hall and Kaplan Rehearsal Space, all in 1987; the creation of the Rose Museum, East Room and Club Room (later renamed Rohatyn Room and Shorin Club Room, respectively), all in 1991; and, most recently, the creation of Zankel Hall in 2003. The renovation was not without controversy. Following completion of work on the main auditorium in 1986, there were complaints that the famous acoustics of the hall had been diminished. Although officials involved in the renovation denied that there was any change, complaints persisted for the next nine years. In 1995, the cause of the problem was discovered to be a slab of concrete under the stage. The slab was subsequently removed. From 1987 to 1989, a 60-floor office tower, named Carnegie Hall Tower, was completed next to the hall on the same block. New backstage space and banquet spaces, contained within the tower, connect with the main Carnegie Hall building. In June 2003, tentative plans were made for the New York Philharmonic to return to Carnegie Hall beginning in 2006, and for the orchestra to merge its business operations with those of the venue. However, these plans were called off later in 2003. The Executive and Artistic Director of Carnegie Hall, beginning in July 2005, was Sir Clive Gillinson, formerly managing director of the London Symphony Orchestra. 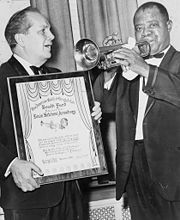 Louis Armstrong receives an award at Carnegie Hall. It emerged, in 1986, that Carnegie Hall had never consistently maintained an archive. Without a central repository, a significant portion of Carnegie Hall's documented history had been dispersed. In preparation for the celebration of Carnegie Hall's centennial (1991), the Carnegie Hall Archives was established. Advertisements and stories in the media about how Carnegie Hall was scouring basements and attics to recover its history elicited an overwhelming response from the public, who had been keeping their old programs: Artifacts began arriving from all over the world. Vast amounts of material, including over 12,000 programs, have been recovered, enabling the Archives to document much of Carnegie Hall's history. Carnegie Hall was the scene of musical and stage performances by the twentieth century's finest musicians, singers, and actors. Although it has been overshadowed by newer and larger venues in New York City, it remains one the most famous venues in the performing arts. For decades, playing Carnegie Hall symbolized that one had reached the top of his or her field. Arthur Rubinstein was once approached in the street near Carnegie Hall, and asked, "Pardon me sir, but how do I get to Carnegie Hall?" He replied, "Practice, practice, practice." In 1991, Carnegie Hall received The Hundred Year Association of New York's Gold Medal Award, "in recognition of outstanding contributions to the City of New York." ↑ Carnegiehall.org, Isaac Stern Auditorium. Retrieved November 19, 2007. ↑ Time Magazine, Sounds in the night. Retrieved November 22, 2007. Garland, Judy. Judy at Carnegie Hall. Capitol Records, 1961. Sondheim: A Celebration at Carnegie Hall. Warner Bros. Publications, 1997. All links retrieved January 13, 2017. Hall History from the official web site. www.carnegiehall.org. NYCfoto.com—Photos of Carnegie Hall. www.nycfoto.com. This page was last modified on 13 January 2017, at 14:56.